Mother Nature really gave Illinois the cold shoulder this year. If there’s anything those who live here can agree on, it’s that this winter overstayed its welcome. This frigid season brought periods of below-zero temperatures, ice storms and high winds. To top it all off, we experienced a polar vortex. Fifty-two straight hours of subzero conditions had people huddled in their homes, avoiding the outdoors entirely. One late November storm delivered a combination of ice, wind and below-freezing temperatures that the Chicago area hasn’t seen in more than 20 years. Although this winter has been brutal, it could have been worse for the families and businesses in northern Illinois that depend on 24/7 access to reliable energy. Thanks to smart grid improvements here, fewer people felt Mother Nature’s effects. New technologies, like distribution automation – “smart switches” that reroute power around trouble spots – helped avoid more than 280,000 interruptions for ComEd customers during storms this season. Along with the smart grid improvements, ComEd crews worked tirelessly through numbing conditions to ensure that others stayed safe and warm. 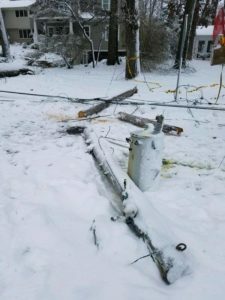 More than 80 percent of the 530,000 ComEd customers who lost power during these harsh winter storms were restored within 24 hours. Check out this video to learn more about smart switches and how they’re improving reliability.